Due to the small blisters in the mouth the animal will typically make a smacking sound or grind their teeth. As the disease becomes well established strings of cohesive, ropy saliva hang suspended from the lips and animals will generally have a diminished appetite, loss of condition and a rise in temperature. 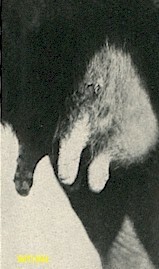 Blisters appear on the udder or teats. Blisters rupture discharging a clear liquid and leaving small red lesions. The surfaces left from the blister heal rapidly. 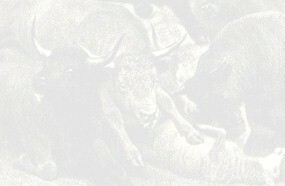 Symptoms of the disease are not only the small blisters that form on the skin between the toes, on the heel or around the top of the hoof, but the animal is also restless, kicks with the hind feet, and the animal will rest on the knees or breastbone in feeding and lies down most of the time. Symptoms in sheep differ somewhat from those of cattle in that lesions in the feet are more pronounced in sheep. All four feet are generally affected. 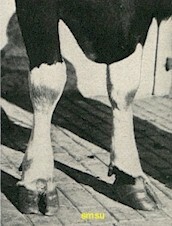 The lesions are usually located between the toes, on the heel, and around the top of the hoof. Severe lameness usually occurs because of intense pain. The animal lies down the majority of the time, usually feeding on its knees or its breastbone. Once the blisters rupture they discharge a clear or yellowish fluid. The hoof eventually separates from the wall. Lesions occur less in the mouths of sheep than in cattle. Blisters usually form on the incisor pad, lips, tongue, cheeks, and hard palate. When the blisters rupture, small reddened lesions are left, which show rapidly. A large portion of the membrane of the mouth is sloughed off. The disease runs its course in two to three weeks. The mortality rate is worse in lambs than in adult sheep. U.S. Department of Agriculture Farmers' Bulletin, No. 1155. "Diseases of Sheep." 1923. 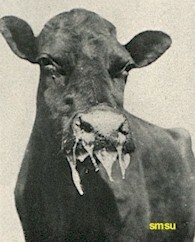 Diseases of Cattle. Department of Agriculture. 1916. This page was designed by JaNell Fowler, Dawn Broos, and Brent Micke.